Originally built by Arnold Palmer in 2003 and redesigned by Brad Faxon, TPC Boston is carved from 300 acers of densely-forested rolling hills of Norton, MA, about 45 minutes from downtown Boston. The first hole is the epitome of that, and at 365 yards it’s a fairly straightforward way to start off the round. Some of golfers will opt to lay up off the tee, but most can fly the fairway bunkers down the right side with a driver. There’s a giant greenside bunker on the left side that guards the green (it was originally built as two bunkers). The back of the green, where they had the pin on Thursday, is relatively flat, but the front of the green slopes pretty violently towards the bunker. Despite a large lake in front of the green, the second hole is one of the easiest on the course. 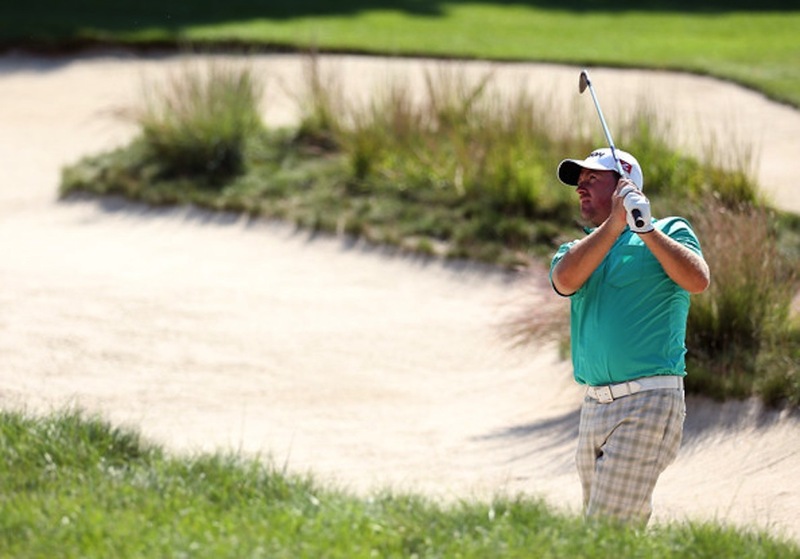 The tee shot is simple: avoid the right fairway bunkers. Some guys can challenge them, which chops some yardage off the total, but the left side is wide open, even in the rough. At 542 yards you will see a lot of guys going for the green in two. There is a large safety bailout area left of the green while the layup area leaves a full wedge shot over water, and with a front pin it can be tricky to avoid spinning the ball back towards the water. The bailout area used to be even more tame, but Faxon’s addition of several bunkers have made it slightly more penal. The green is tiered, and putting the ball on the correct section is integral. Putting the full length front-to-back (uphill) or back-to-front (downhill) is not easy. Newly lengthened, the third hole is one of two par threes on the front nine that measures over 200 yards. It’s relatively easy hole when the pin is on the left, as it was in the first round, but it can be tough when the pin is in the front-right, as it was in the second round. 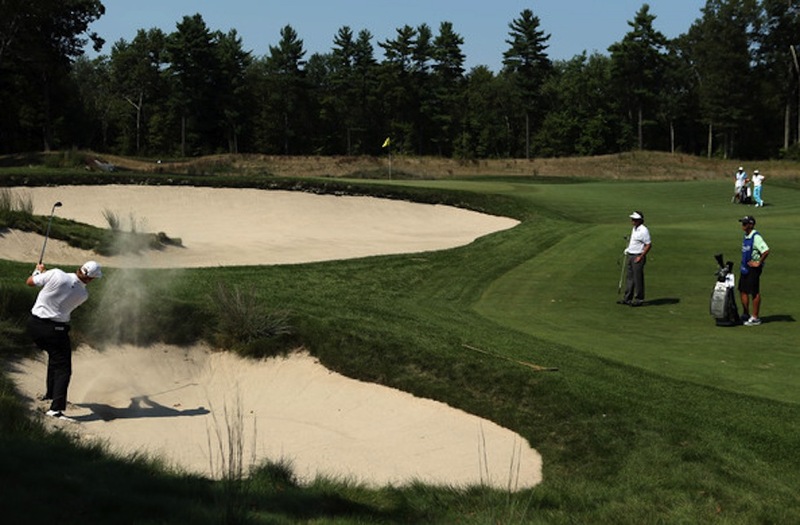 The left side is made even easier by a large run-up area in the front that takes the bunker completely out of play, while the right side brings that deep, angled sand trap into play. The fourth was heavily remodeled by Faxon and his team, and was shrunk by over 100 yards, now playing at 298 yards (the Google Earth images are pretty striking). The green is by far the trickiest on the front nine, not only to hold but to putt on, and the landing area is no respite either. 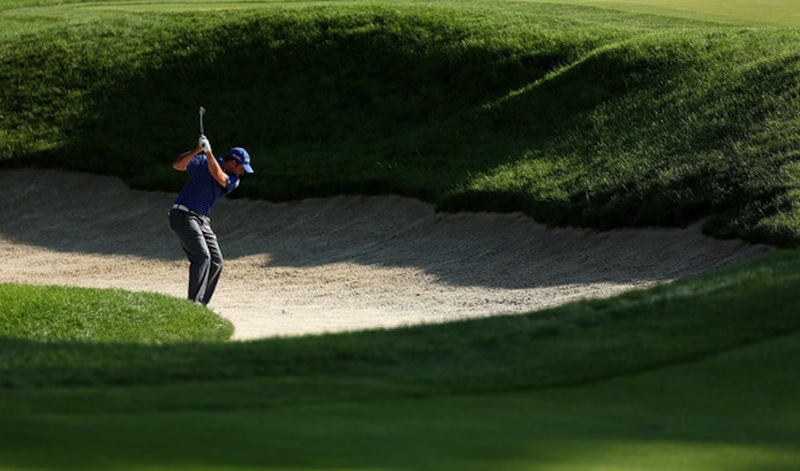 If you try to layup short, about 250 off the tee, there are three bunkers down the right side that can get in the way. Two bunkers are situated up around the green, a small one and a large one, and they come into play no matter what you hit off the tee. The smaller one is farther from the putting surface, and requires you to hit over the ominous large bunker that guards this staggeringly narrow green (as Ernie Els experienced in the below pictures). The right side of the green, which sits in wait for bunker shots that go a bit long, is a large depression, and chipping from there means hitting to the elevated green nearly at eye-level. The bunker shot that Tiger Woods hit from the left side of the large bunker on Thursday this year didn’t look all that difficult, but from that lie and to that front pin position it’s among the best that you’ll see all year. The fifth hole might be my favorite on the course. At 466 yards it’s full-on grip-and-rip off the tee. There is a small stream that bisects the fairway and two pot bunkers near the landing area, but only the bunker on the left comes into play much (Faxon removed several larger sand traps, leaving only the one that juts into the landing area). The fairway is more sloped than the TV coverage shows, and drives often get a good deal of runout. The approach shot is a picturesque scene, as the green and the surrounding trees create a bowl-shape that focuses the sunset. A large bunker (seen below) is set along the left side, and the green slopes sharply back-to-front. You won’t see many putts outside of about 10 feet made. If the fifth hole is my favorite, the sixth is the one I loathe the most. The two holes are about the same length, but the sixth is level and plays over water. The fairway is wide, although two bunkers down the right side and the water on the left (which you really can’t reach off the tee but which still looms large) make the drive look tougher than it actually is. The sightline and the design of the green begs for a right-to-left draw for the approach, but with bunkers and the water, a bailout to the front-right is the easy play. The farther back they put the pin the tougher the approach becomes, and putting the length of that green is no guaranteed two-putt. The green runs back-left-to-front-right, so it can be nearly impossible to stop the ball from those back sand traps. 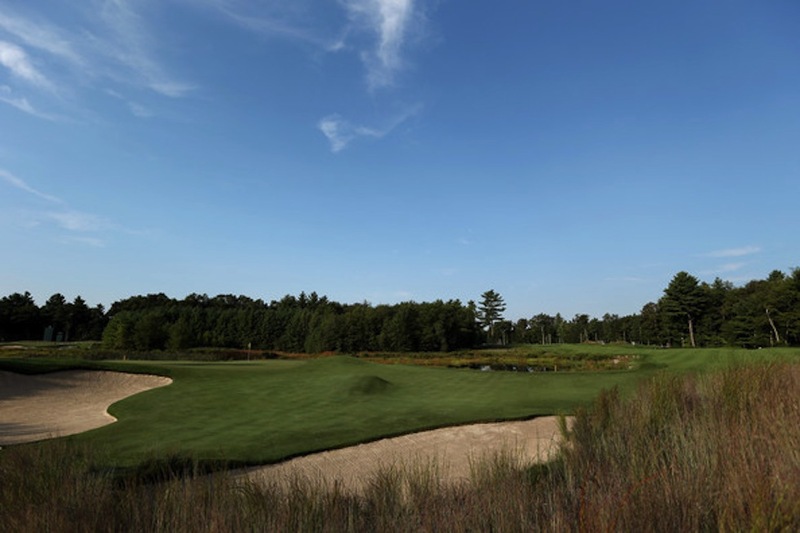 The seventh is the longer of the two par fives, measuring in at 600 yards, and only the longest of long players can put the ball on the green in two. The tee shot is to a narrow landing area, but the trees on both sides of the fairway are thin enough to play out of. A 30-yard long bunker, added by Faxon, bisects the entire fairway about 100 yards out, which means that third shots either come in from 50 yards or from 150 yards. The layup area closer to the green is made even smaller by a massive bunker that guards the front and left side of the green. Birdies are made in two ways on this hole. The first is by long players that can run their second shots up with a fairway wood to an area short and right of the green. That leaves a fairly simple pitch, and it is the best angle for approaching this green, no matter where the pin is. The second, a tactic valid on most holes but tougher on those measuring 600 yards, is to knock one stiff from a longer-distance approach shot, which is not easy thanks to a tricky green, reminiscent of the sixth hole. The eighth hole, much like the third, is a relatively straight-forward par three. The water visible is nearly completely out of play, and even the two bunkers aren’t all that penal (there used to be a third, but it was combined with another one on the left). The green is two-tiered but it isn’t that hard to putt from one tier to another. The length, 213 yards, is the only reason this isn’t a total birdie hole (though it has played under par so far this year). The front nine finishes with a 472-yard par four that does tend to play shorter. The tee shot is straight away, as no one will reach the sand on the right and most players will not be able to reach the bunkers on the left. Some will, however, in an attempt to cut off the dogleg left, but even they won’t have more than a wedge to the green. Most players will have a mid-iron to a fairly tame green that is receptive to pretty much any type of shot, and the bunker that fronts that green is not even close to being in play. At some point the pin will be placed in the front-middle of the green, along a low-lying seam, so expect birdies that day. Photo Credits: © Warren Little, © Warren Little, © Warren Little, © Warren Little, © Warren Little.